11 1/2" x 16" open. Text by Jerome Rothenberg. Letterpress with etchings, rubber stamps and collage. Artists who have mastered the techniques of printmaking and printing often maintain total control of the book. This may involve writing, illustrating, typesetting, platemaking, printing, and binding, or collaborating with other writers and artists. The artist traditionally looked at as the predecessor of this way of working is William Blake. In this century, the Futurists produced their own books, but as a collective enterprise rather than as single artists. 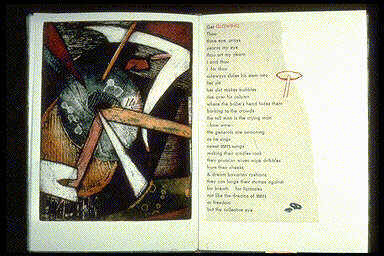 More contemporary illustrated books published by the artist are coming to this page.